The Herpetological Society of Ireland is not a lobby group, and as such we will refrain from directly endorsing any candidates, or parties, ahead of the upcoming general election. However it is important to note that widespread political apathy on environmental/wildlife issues has facilitated some incredibly reckless and irresponsible actions from our elected officials. We can no longer afford for environmental issues to be treated with indifference. We desperately need action and we need accountability for those who fail in this regard. This post compiles some of the most egregious instances of failure on environmental policy. We urge you to consider the record of your preferred candidate/party before you make your final decision. 1. Our resources are limited, and as such we have almost certainly overlooked other failures. Feel free to contact us at info@thehsi.org with other examples. We will add them if we feel it is appropriate to do so. Please check back here regularly for updates. 2. We acknowledge that, in some cases, representatives have been in good standing on environmental issues but are forced to act against their stance to placate the party whip. We commend them for their stance, however it is long past time that our representatives feared failing their constituents, more than failing their party. An Taoiseach Enda Kenny – Following the historic, 2015 Paris Climate Conference, the Taoiseach stated that climate change was not a priority for Ireland and that the nation would fail to meet our emissions target for 2020. This comes despite projections that Ireland and the UK will suffer the worst impacts of climate change in the the EU. This position is untenable in that it fails to address the threat posed, but also the significance of our contribution to it. Minister Heather Humphreys – Attempted to make detrimental changes to The Wildlife Act. These changes have been condemned by groups such as An Taisce, Birdwatch Ireland, The Irish Wildlife Trust, Hedge Laying Association of Ireland, and The Herpetological Society of Ireland joins them in their condemnation. The Minister proceeded with the Bill despite the public consultation finding that most were against the changes / The Irish Hare has gone extinct on the North Bull Island, UNESCO Biosphere Reserve on the Minister’s Watch/ Unprecedented damage to Special Areas of Conservation, by wildfire, occurred in 2015 under the Minister’s watch/ Facilitated two weeks of filming on Skellig Michael, during the height of the breeding season for the resident seabirds, despite objections from An Taisce and other environmental groups. Filming at a less intrusive time would have satisfied both environmental and economic considerations. Minister Simon Coveney – Negotiated fishing quotas for Ireland that exceeded scientific advice by 25%, making Ireland the worst offenders in Europe for overfishing. This action also contravenes the Common Fisheries Policy which sought to end overfishing in Europe by 2015. 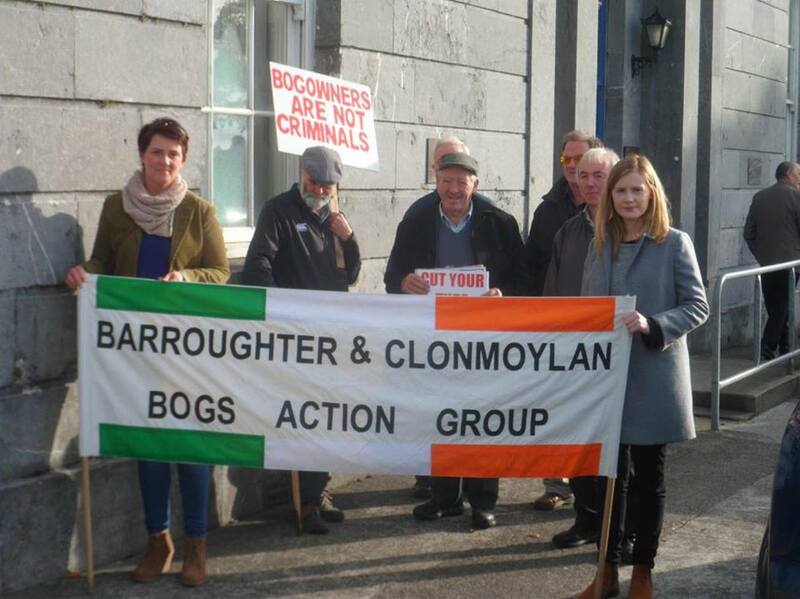 Councillor Jimmy McClearn – Has shown considerable support for those who illegally cut bogs. Senator Pat O’Neill –Supported harmful changes to the Wildlife Act proposed by Minister Humphreys. Senator Martin Conway -Supported harmful changes to the Wildlife Act proposed by Minister Humphreys. Senator Colm Burke -Supported harmful changes to the Wildlife Act proposed by Minister Humphreys. Senator Catherine Noone -Supported harmful changes to the Wildlife Act proposed by Minister Humphreys. Senator Eamon Coghlan -Supported harmful changes to the Wildlife Act proposed by Minister Humphreys. Senator Michael Mullins -Supported harmful changes to the Wildlife Act proposed by Minister Humphreys. Senator Jim D’Arcy -Supported harmful changes to the Wildlife Act proposed by Minister Humphreys. Senator Terry Brennan -Supported harmful changes to the Wildlife Act proposed by Minister Humphreys. Senator Michael Comiskey -Supported harmful changes to the Wildlife Act proposed by Minister Humphreys. Senator Caít Keane -Supported harmful changes to the Wildlife Act proposed by Minister Humphreys. Senator Maurice Cummins -Supported harmful changes to the Wildlife Act proposed by Minister Humphreys. Councillor Den Stack – Supported illegal activities of turf cutters on protected bogs. 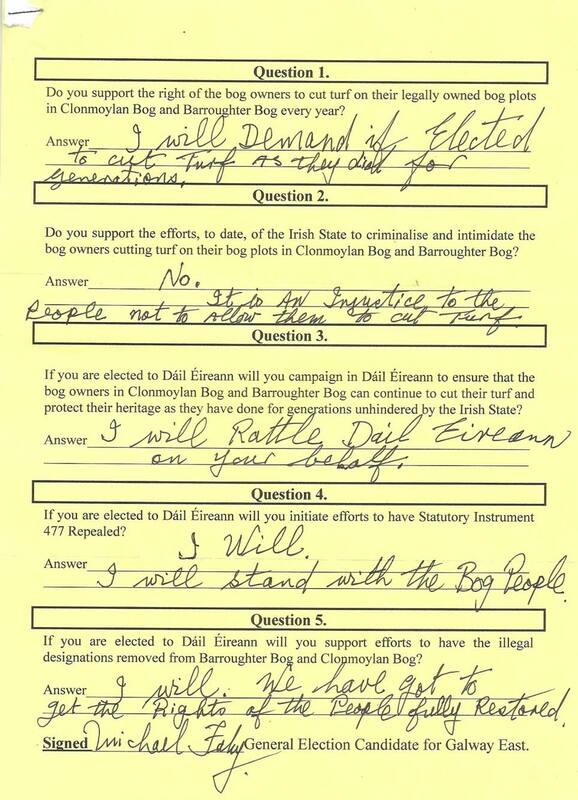 Councillor Anne Rabbitte – Pledged to support illegal activities of turf cutters in Barroughter and Clonmoylan. Senator Brian Ó Domhnaill –Supported harmful changes to the Wildlife Act proposed by Minister Humphreys. Senator Labhrás Ó Murchú –Supported harmful changes to the Wildlife Act proposed by Minister Humphreys. Senator Diarmuid Wilson –Supported harmful changes to the Wildlife Act proposed by Minister Humphreys. Senator Ned O’Sullivan –Supported harmful changes to the Wildlife Act proposed by Minister Humphreys/ Called for a cull of “seagulls”, despite protected status and dwindling numbers of species such as Herring gulls. Senator Mark Daly –Supported harmful changes to the Wildlife Act proposed by Minister Humphreys. Senator Paschal Mooney –Supported harmful changes to the Wildlife Act proposed by Minister Humphreys. Senator Terry Leyden –Supported harmful changes to the Wildlife Act proposed by Minister Humphreys. Senator Ivana Bacik –Supported harmful changes to the Wildlife Act proposed by Minister Humphreys. Senator Aideen Hayden –Supported harmful changes to the Wildlife Act proposed by Minister Humphreys. Senator Mary Moran –Supported harmful changes to the Wildlife Act proposed by Minister Humphreys. Senator John Kelly –Supported harmful changes to the Wildlife Act proposed by Minister Humphreys. Senator Máiría Cahill –Supported harmful changes to the Wildlife Act proposed by Minister Humphreys. Senator Denis Landy –Supported harmful changes to the Wildlife Act proposed by Minister Humphreys. Councillor Dermot Connolly – Has shown support for illegal turf cutters on protected bogs. 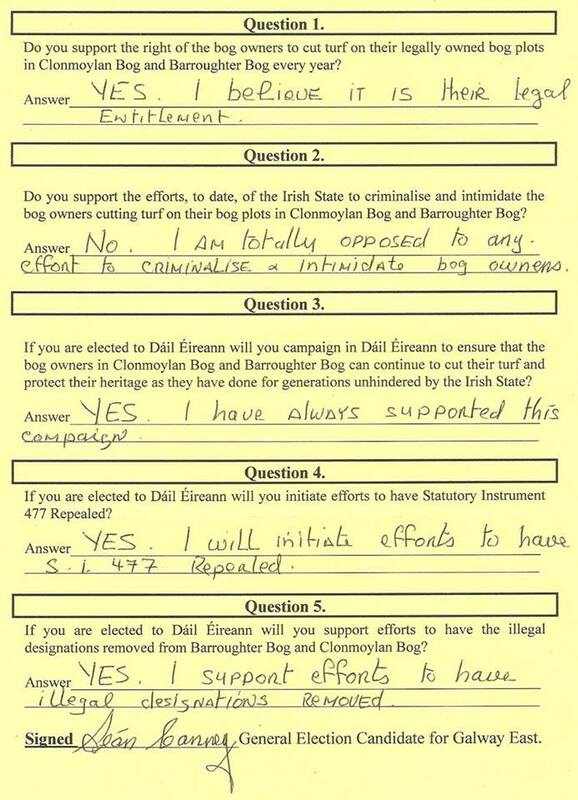 Annemarie Roche – Pledged to support illegal activities of turf cutters in Barroughter and Clonmoylan. 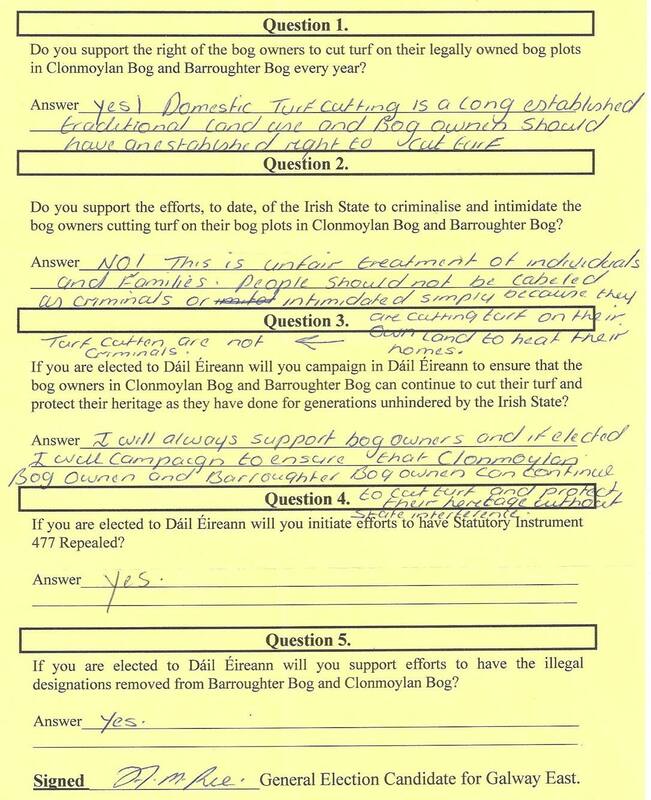 Clare Kerrane – Supports illegal activities of turf cutters in Barroughter and Clonmoylan. Martin Ferris – Supports illegal activities of turf cutters on protected bogs. Councillor Michael Fitzmaurice – Chairperson of the Turf Cutters and Contractors Association. 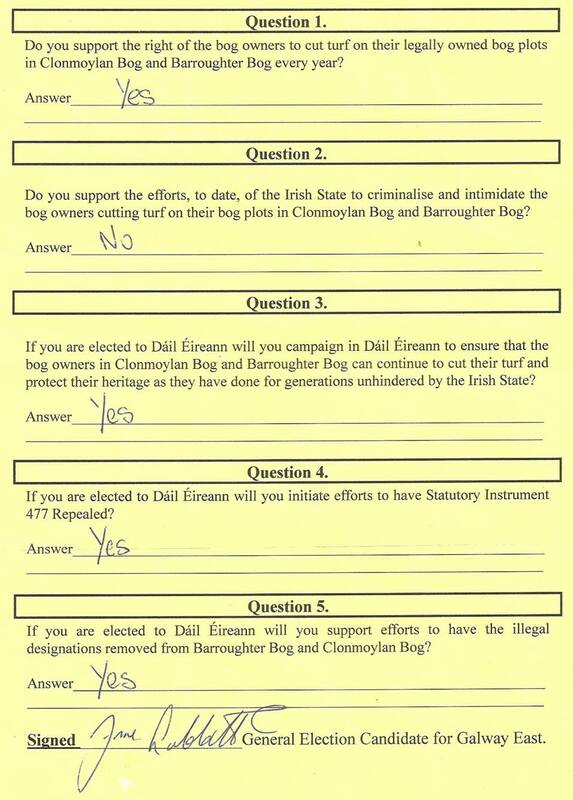 Has consistently engaged in, and promoted, illegal cutting of protected SAC bogs. Consistently scapegoats EU legislation that protects our environment, despite availing of EU payments himself. Advocated for dredging of rivers to alleviate flooding despite the fact that this will NOT rectify the issue and will only lead to further environmental damage. 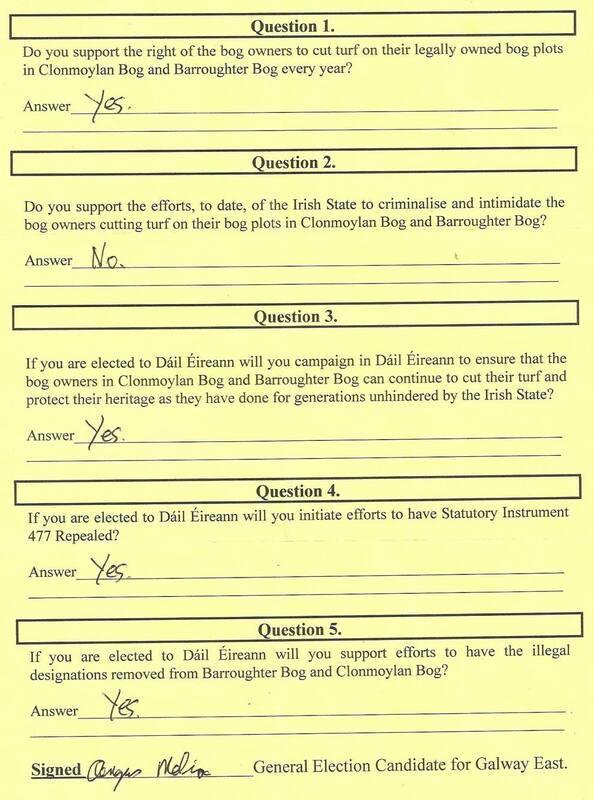 Michael Healy Rae – Supports illegal activities of turf cutters on protected bogs. Councillor Michael Fahy – Pledged to support illegal activities of turf cutters in Barroughter and Clonmoylan. Councillor Seán Canney – Pledged to support illegal activities of turf cutters in Barroughter and Clonmoylan. Senator Jillian van Turnhout –Supported harmful changes to the Wildlife Act proposed by Minister Humphreys. Senator Jim Walsh –Supported harmful changes to the Wildlife Act proposed by Minister Humphreys. Senator Fiach MacConghail –Supported harmful changes to the Wildlife Act proposed by Minister Humphreys.